HSM or High Speed Machining is becoming more and more popular each day. Many of us have seen those youtube videos where endmlls remove large amounts of material at high speeds/feeds. While definitions of HSM may vary between tool manufacturers and even individual shops, the physics behind it remain the same. In this article i would like to explore flat endmills. HSM is not about ramping up your speed/feed overrides to 200% and puling out your smartphone to record another youtube-worth video. HSM is a complex of programming, machining and tooling techniques aimed at radical increase of productivity. The cornerstone of HSM is low radial and high axial engagement of an endmill with the workpiece. There are many CAD/CAM systems that allow you to create HSM tool-paths. Mastercam's Dynamic milling and SurfCAM's Truemill are some of them. When radial cutter engagement with the material is smaller than the radius of the tool an interesting thing happens. Chip load- the distance the tool advances per cutter revolution per tooth- does not equal the actual chip thickness anymore. Chip thinning mainly happens at radial engagements below 30% of the diameter. In order to get compensated chipload you need to multiply recommended by manufacturer chipload by the chip thinning factor. Usual Radial Engagement for HSM toolpaths however is between 5 and 15%. Axial depth of cut varies depending on geometry, but generally you can utilize the whole length of the flute. 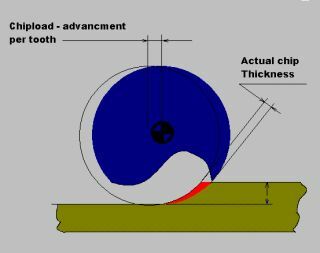 Chip Thinning allows to increase not only feed rate, but also cutting speed. As cutting edge is shearing a layer of metal friction causes generation of heat. Some of the heat gets absorbed into the workpiece, but most of it is getting transferred into the swarf. And less heat means longer tool life - you can actually increase cutting speed by several times without sacrificing tool life. Increased cutting speed makes use of coolant not advisable. As hot swarf contacts coolant it may harden (in case of tool steels) and when re-cut will damage the cutting edges. Also contact of the coolant with overheated cutting edge will cause thermal cracking and premature wear of the endmill. Popular AlTiN and TiAlN coatings for example actually require heat to "activate" coating and make it work. Air blast is required not to cool the tool, but actually to clear the chips from the cutting zone. Chip thinning will happen with any endmill, so HSM is possible even with general purpose endmills. However. There are several points to consider. Endmills designed for HSM usually bear "High Performance" or "HP" name. They often have multiple flutes (5 to 7 for a 1/2" endmill) and a thicker core that allows endmill to withstand high cutting forces. Increased number of flutes and thicker core leaves little room for swarf, so very often those kind of end mills are not suited for conventional milling or slotting. Also one of the most noticable features of HSM tooling is a higher helix angle. Higher helix allows more than one flute to be in contact with the work piece at any moment in time. This makes entry of the cutting edge into the work piece smooth and gradualal. Increased helix also directs more of the cutting force in the downward direction thus decreasing deflection. At the same time increase in torque on the cutter and higher down force may cause an end mill to slip inside a regular ER-style collet tool holder. Thus HSM tool paths require rigid tool holding. Making side-lock screw holders or milling chucks a more preferred option over collet holders. Increased axial force can also cause your work piece to pull out from vise, so a rigid clamping is required. Coating is very often used tooling. It allows to increase cutting speed and tool longevity even more. While some coatings provide extra heat resistance, others may offer better lubricity and wear resistance. Always make sure you are using a proper kind of coating for each application. Improved chip evacuation: chips are less likely to clog the flutes. Chip Thinning allows to increase cutting feed several times over. Better distribution of load over the length of the flute: higher feeds and more MRR possible. Longer tool life: wear spreads over longer portion of the flute. All this translates to: better productivity through higher material removal rates and longer tool life. Increase in feed rate, cutting speed and tool life saves time and money. Now you ask "how do Iknow what kind of parameters to use in each individual case?" HSMAdvisor combines solid practical knowledge of manufacturing techniques with latest advancements in tooling and coatings. Its unique tool model prevents tool breakage and allows to maximize productivity while not compromising on tool life and safety.